Here is a recipe for one of our favourite ‘go to’ meals. Finely dice or chop all vegetables, placing them in a large bowl as you go. Toss together with the sprouts. Serve into bowls, top with raw nuts. Pour over desired amount of dressing for each single serve. Put all ingredients in a clean glass jar, screw on the lid tightly and shake to combine. Pour a small amount over salad and toss to just coat the vegetables in a thin layer of dressing. 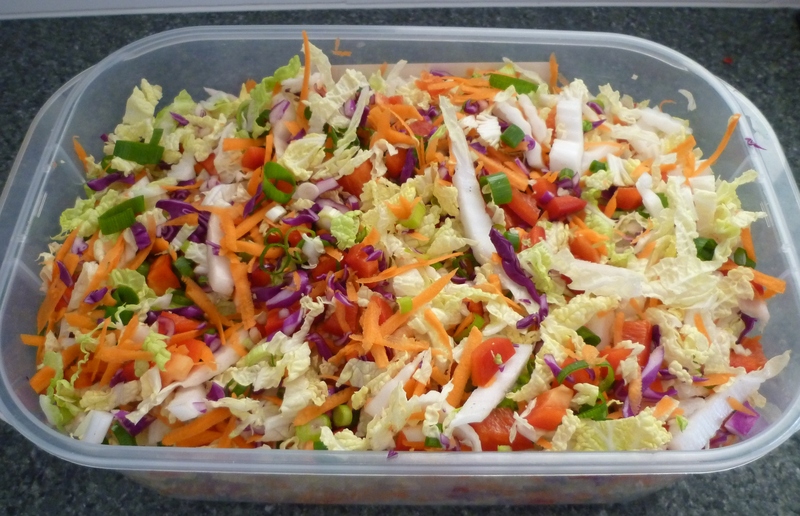 All amounts of the vegetables are approximate – I usually just see how the salad looks coming together, adding more of any vegetable needed to give the salad a nice balance of colour and flavour. I make the salad up in a big container and only add dressing to the salad once its served in individual bowls. This means that the rest of the salad stays fresh in the container in the fridge and we eat it over two or sometimes three meals. The amount of dressing in the recipe also lasts us for more than one salad and keeps well in the jar if stored in a cool place. These days I tend to make a lower sugar version of the dressing by replacing the maple syrup with a teaspoon of granulated stevia. For this variation I usually use less olive oil as well. This entry was posted in Veganism, Walking The Way on January 28, 2014 by Mary. Thank you for posting this recipe. I recently discovered the Divine Love Path and was just looking at vegetarian recipes for the first time this morning. Law of Attraction at work for me here 😉 This looks and sounds delicious! I hope you enjoy it Jennifer! Thanks for the recipe Mary. 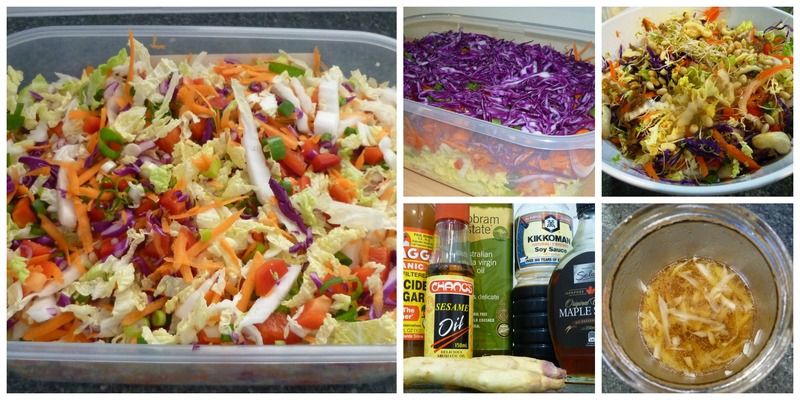 Cabbage salad is one of my favorite meals, I make a variation on the traditional Croatian cabbage salad, I love nice dressings, looking forward to trying yours. Do you and Jesus mostly eat raw food? 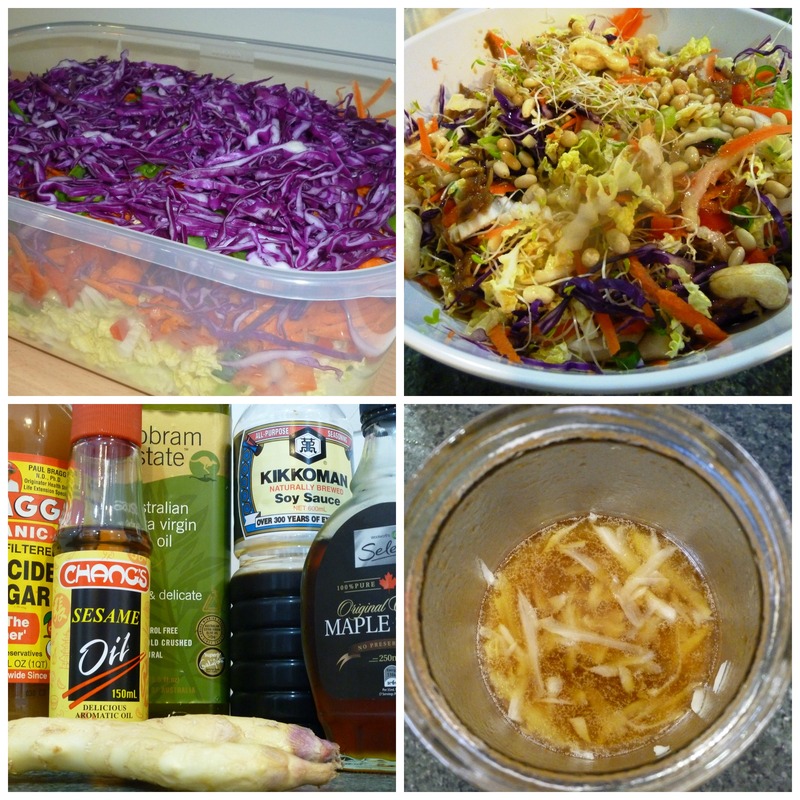 I’d love to know your recipe for Croatian cabbage salad! We do tend to eat mainly raw food, although this has not been a conscious choice to ‘go raw’. It has naturally evolved as we have each dealt with emotions. We still have some cooked favourites. Mainly I feel incredibly blessed to have the luxury of having such a varied diet. I love experimenting with new flavours and textures with food. traditional Croatian cabbage salad is very basic, you just shred normal cabbage very finely, add plenty of white pepper, (works better than black) salt, normal vinegar and a bland oil like say peanut. The crucial key is how you shred the cabbage to make it really fine, you need to halve the cabbage, hold it up by the stalk part (so that the stalk is almost vertical to the chopping board) and run your knife along the flat edge of the cabbage to get really fine almost translucent shreds, then as you go you cut the cabbage to create even planes to run your knife along. The very fine shred makes the normal cabbage really nice to eat and I like it dressed a bit before you eat it. I add spring onion, very fine long strips of red pepper, carrot, sometimes purple cabbage and coriander which works really well but then I think coriander makes everything taste better. Flat leaf parsley also works well if you don’t like or don’t have coriander. I know you have links to cooking blogs, some of the recipes have become staples for me but if it wouldn’t be hijacking your blog I would love to have people post recipes that they have found work really well and are quick and easy. The food people bought along to the seminar I went to in Murgon was amazing. I don’t really know how to contact you guys but I’ve really been trying to take responsibility for my own feelings and inuition without trying to ask anyone how to do anything. After I left the retreat I received divine love and since then have experienced lots of fear, or at least more than I have my whole life. I feel much stronger and my heart has a more steady beat. I know there’s more. But my question is along the line of passions and desires since you posted this. I have made a decision that I want to be a traveling street performer and make all the money I use for personal things from this. I want to cut myself off from the unloving financial income I have recieved from my past. The truth is without that money I won’t be able to go to Texas again. So this year will be the last I use this income to attend. But my soul passion is music and singing. I’ve decided I’m going to live out of a van I’ve set up to buy here in the states, buy some music equipment to start experimenting with and just go out and do it. My problem is that God is overwhelming me constantly and the painful effect of the truth exposing my feelings. I feel that this will certainly help me break through my facade without a doubt in the next few weeks for I am 100% focused on my relationship with God every day. But my feelings are that while I’m experiencing pain and in denial of my fear and grief, the less satisfying my performances will be to crowds therefore my attractions will not be as strong in a positive way. I want my music and even my voice to have more love in it and not hiding my true feelings inside. I guess I’m asking weather you think it would be more wise to focus on God first, experience my emotions over time and then pursue my passions when I’m not in as much denial. Or should I just push myself to go out in the world and feel the pain while I play and not worry about feeling fear and grief in public. I wouldn’t ask if this wasn’t a big deal for me. I’d love to receive some feedback about this because it’s definitely going to change my life. To live purely off my passion for music and humble myself in the midst of this large world is truly what I would like to do. I just know in my heart these emotions of fear and grief while becoming open to divine truth and totally breaking through my facade, well it’s a lot more than just a nice coffee shop set with some melodies. That’s why I’ve chosen to perform in the street so I can really be in touch with my emotions. Also on top of that my Mom emotions totally affect my voice and I want to change that! Anyways, thanks for this post, and thanks if you’ve read this.